Ryzza Mae Dizon on playing Boss Madam in Eat Bulaga's "Barangay Jokers" segment: "I enjoy this role and it does not feel like work to me." Ryzza Mae Dizon showcases her wit, charm and humor as she takes on a new role in the longest running noontime variety program Eat Bulaga! From being recognized as “Aling Maliit,” the 12-year-old portrays a grumpy, fierce, and strict character named Boss Madam in Eat Bulaga! 's segment "Barangay Jokers." Every day, the former “Little Miss Philippines” winner would dress-up in adult clothing, exchange banter with EB Baes—Jon Timmons, Kenneth Medrano, Joel Palencia, Tommy Penaflor, Kim Last and Miggy Tolentino—and re-enact the sent in comedy gag sketches and jokes created by the Dabarkads. 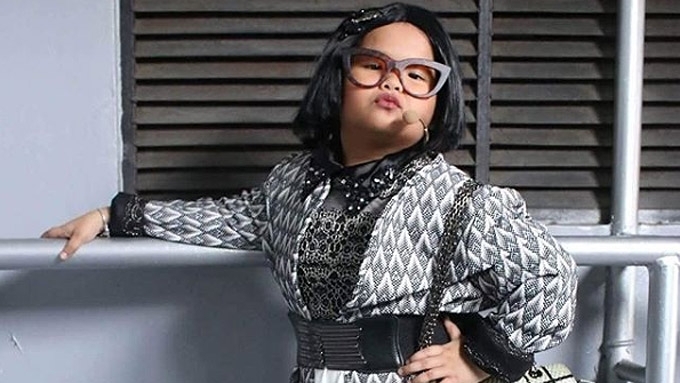 "I realized that it’s nice to be the boss," said Ryzza Mae, who was comfortably wearing a fur coat, oversized shades, and kitten heels. The young TV host added that she likes portraying Boss Madam because she is allowed to add personal nuances to her character. She also gets to work closely with Eat Bulaga! creative head, Jenny Ferre. Ryzza Mae continued, “There’s really no secret on how to play this role. You just have to focus on work at hand. “It also helps that I get the support of everyone in EB. “They help me on what to do and how to properly deliver my lines. “I also have a stylist who does all the costume picking for me. “I also get help from Tita Ruby [Rodriguez] and Tita Pia [Guanio] for some of the bags I use. Boss Madam: Wow! Late na late ka tapos wag kita sisihin? Ano to? Ang bilin jo lang sa yo: BILISAN MO. Hindi mo pa ko masunod! Patrick: Boss Madam, sisihin nyo po yong katabing school nitong office... Nakalagay po kasi "School Zone. Sloooow... Dooown..."
Ferre said it's not difficult to think of roles that would fit Ryzza Mae because she listens and focuses on her craft. The television executive admitted though that six years ago, they initially struggled to think of a perfect concept for television for the child star, who just won "Little Miss Philippines." "I really don't know what to do with this cute girl,” Ferre said. “Then I noticed that every time we post something on social media, netizens respond positively. Patrick: BOSS MADAM! Paano ko makukuha yong plate number eh humarurot nga yong sasakyan! Coincidentally, Ferre needed to produce a late morning program that will air before Eat Bulaga! When she saw how natural Ryzza was in front of the camera, she thought of making the then seven-year-old female star the host of her own talk show titled The Ryzza Mae Show. "Ryzza is my biggest gamble,” she said. “During that time I didn’t know what to do or how to start it but the show survived for two and a half years. Six years on, that same passion and hunger when she first auditioned in "Little Miss Philippines" is still very much present in Ryzza Mae. Her mother and her constant companion, Rizza Dizon, said that their family still couldn't believe the opportunity given to them by Eat Bulaga! She said that from their humble beginnings in Angeles, Pampanga, their lives definitely changed for the better. “Until now, we couldn’t believe the blessings we received from the Lord. Our lives have changed because of Ryzza’s hard work. “I’m constantly reminding her that not all kids were given the same opportunity, so we have to be grateful always. Not everyone gets the same chance to perform in Eat Bulaga! Meanwhile, Ryzza said she's living her dream. If given more opportunities, she also wants to do more movies, portray more roles, and even work with different actors. But more than anything, she wants to continue to make people happy. “When I hear praises, that I did a good job, it pushes me to do more and better my work. “When someone says good comments about me, I get super happy. When asked for a message to kids her age who also want to join show business, Ryzza said, “Always pray to Papa Jesus because he will give it to you. “It is also important to always say thank you for all the blessings you received. In the segment, Alden Richards is cast as Patrick, the driver of Boss Madam. My Driver and Executive Assistant, Patrick and Kendoll ??????????? ?